"Everyone has a New York in their heads, even if they have never been there." At least once a week now, for professional circumstance, I take the A train down to the Chambers Street Station, and the view to the right never fails to stir my emotions, to bring back that particular mixture of sadness and outrage. All you can see are huge tarpaulins now, pretty much, and enormous pieces of construction equipment; most of the site can't be seen from the street, but we all know what's behind those tarps. Or, more precisely, what was behind them: the Twin Towers of the World Trade Center, the proverbial ground zero. These several years haven't diminished any of the anger, or mourning, or camaraderie, or disbelief that came with 9/11 and the days immediately afterward; but it's obvious that that cataclysmic event radically changed our take on the towers themselves. They weren't much loved as buildings while they stood, these behemoths with narrow windows; but their loss gave us a keen reminder of our vulnerability, even in the greatest city in the world. 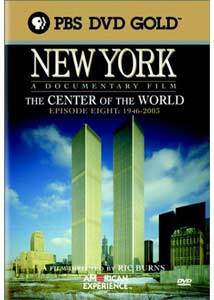 In the summer of 2001, documentarian Ric Burns was finishing up his seven-part series on the history of New York; it was first broadcast shortly after September 11th, and two years later he returned to the material to produce this film, a look at the rise and fall of the World Trade Center, which is functionally Part Eight in his series. It's an education in mid-century big city politics and the changing face of power, and it's a story that probably wouldn't be told in this manner if planes hadn't been crashed into the buildings. But this is a smart bit of documentary filmmaking, and will illuminate things about the ways of New York for even the most jaded Manhattanite. The World Trade Center wouldn't have been possible without one family: the Rockefellers. David, the head of Chase Manhattan Bank, wanted to keep businesses from fleeing downtown for midtown; his brother Nelson, the Governor of New York, had the political muscle to take care of what the family fortune couldn't. One of the most amazing things about Burns's film is the assembled archival footage, from the early days of the New York harbor, through the construction of the towers, and of course to their demise. The film serves as a de facto history of downtown New York, and features many larger-than-life figures, especially Austin Tobin, the head of the Port Authority, the agency that built the buildings. On hand also of course is Minoru Yamasaki, the architect of the towers, whose previous works seem as fussy as an overdecorated birthday cake, and whose twin towers were brutalized by the architectural press. Yamasaki is referred to as a "low-end high art architect"�he was no Wright, no Gehry�and Robert A.M. Stern, a venerable architect himself, refers to the project as "the Conrad Veidt of buildings...the buildings you love to hate." Once they went up, they did in fact become part of city life�Burns spends a good deal of time with Philippe Petit, the young Frenchman who strung a tightrope between the two towers and walked across. This may have done more than anything to humanize these buildings. (Curiously absent from the film is George Willig, who one morning took his mountain-climbing equivalent and scaled up the outside of one of the towers.) And then of course one horrible morning the buildings came down. Burns's narrative of those September days is understated, and David Ogden Stiers is well suited to his job as the narrator. Still, it's hard to look at some of this familiar footage, especially that of people either forced out of the top floors by the heat or despairingly plunging to their deaths from a height of ninety-five stories or more. It would be foolish to say that the lessons of 9/11 are clear to us now; things change every day. The twin towers are treasured more now than when they stood, these monuments in our memory not to soaring ambition, but to our collective fragility. Burns' film is a respectful, informative and moving look back at their history. Image Transfer Review: The archival footage of course varies in quality, and occasional scratches in the new interviews detract somewhat from the overall presentation; but generally this is pretty well shot and transferred. Audio Transfer Review: A well-balanced and clear audio track, with little or no hiss or ambient noise. Extras Review: Director Ric Burns sits for a brief interview (07m:48s), in which he discusses his New York series as a whole; he thought that his work was done in the summer of 2001, but by nightfall on September 11th, he knew that this last story needed to be included. Also here is a sequence (03m:51s) deleted from Part Seven of the series, about the 1945 crash of a military plane into the side of the Empire State Building�it was cut because the episode was first broadcast on October 1, 2001, far too close for my comfort. The disc also includes some interview footage (18m:56s) not included in the feature; the talking heads are Petit, former Mayor Ed Koch and former Governor Mario Cuomo, journalist William Langewiesche, and Ada Louise Huxtable, longtime architectural critic for The New York Times, and no fan of Yamasaki's towers. She discusses rebuilding, and implores us all to avoid "the routine, clich� conception of something tall." (If you've seen the designs for the site, it's clear that Daniel Liebeskind wasn't listening.) Weblinks are to two PBS sites: one about this documentary, another for their series The American Experience. A smart, stoic, and well-informed account of the life and death of the World Trade Center, and its place in the life of the city of New York.